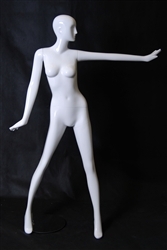 Courtney is an Fleshtone Female Mannequin that stands at 5'5" and appeals to many consumers. Great in any type of apparel and looks great. Size 0 Size 2. Shortest Female mannequin we have. Teenage Female Mannequin Age 14-16 years old 5'5" tall for all your tween mannequin clothing. Arms and one leg come off for easy dressing! She has molded hair but will also accommodate a wig. Height - 5'5" or 65"